Flowers. I buy way too little flowers, but I do get flowers from my husband once in a while. They have the power to brighten up your day just by looking at them and smelling them. The little things in life, but oh so powerful! #FlowerPower. In a world where social media is so present, it is great to be reminded of the beautiful things in life such as flowers. I’m not sure how or when it happened, but while I was scrolling through my instagram feed one day, I stumbled upon the mesmerizing account of Cristina Colli. If you visit her instagram account, you’ll know immediately what I’m talking about. Every photo Cristina shares, tells a story and that got me fascinated. I visited her website and eventually I reached out to Cristina, and she was happy to answer some of my burning questions. 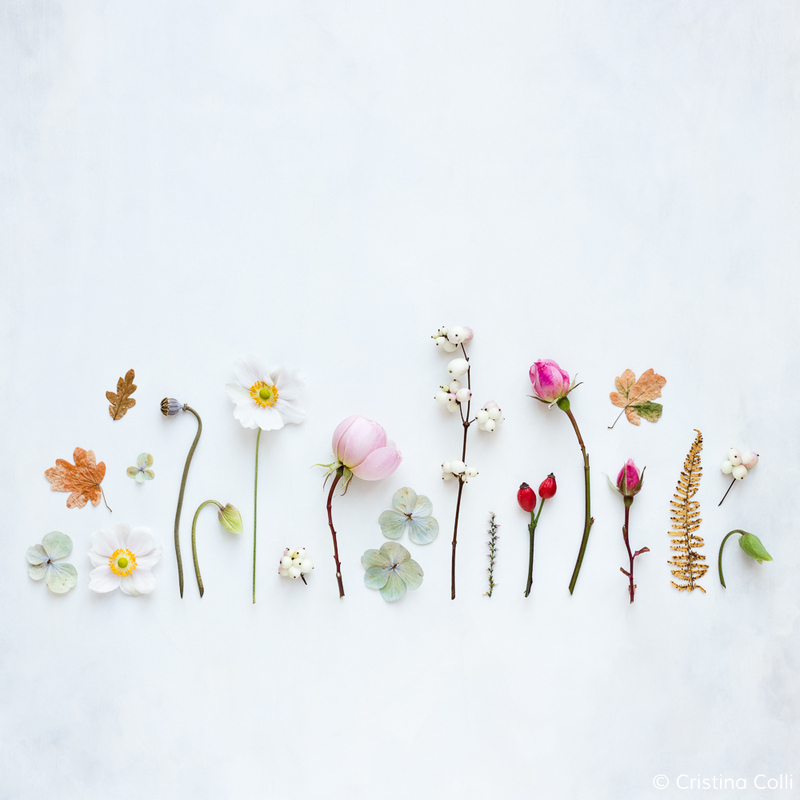 Cristina Colli is an artist, photographer, and teacher in love with creativity, visual storytelling, flowers, simplicity, and slow living. She’s an introvert and HSP, and when she’s not creating, you can usually find her curled up on the sofa reading a good book, drinking tea, or walking in the countryside. She lives in Oxfordshire, UK, with her husband and two cats. Cristina shares her general musings on her blog, writes a monthly newsletter ‘Creative Notes’ and teaches visual storytelling online. What is still life photography / visual storytelling to you? How did this passion start? ‘I’ve always loved photography but in the last 6 years it’s become my favorite way to express myself and my vision of the world. I adore flowers, and always have. I love their fragile beauty, they soothe me and they make me happy. I like to create visual stories that capture all the little details often overlooked, like the graceful curves and velvety texture of a flower, and the simple pleasures of everyday life, like a quiet moment spent reading a book, drinking a cup of tea, or putting flowers into a vase..
What makes a perfect composition? ‘That’s not an easy question…composition depends on what you are trying to express with your photograph, so what works for a picture might not work for another, but in general I like to have enough space in my image to let the subjects stand out, and pay particular attention to colour, textures, and shapes. I tend to use similar colours that go well together, with accents in a contrasting colour to lift the composition. I also work in odd numbers, because they naturally look good together – so three or five objects rather than four or six, and I photograph in natural light. Favorite flowers to work with? First of all, the sense of satisfaction that comes from creating something from nothing, and that’s true not just for my images, but also for e-courses, blog posts, and magazine features. 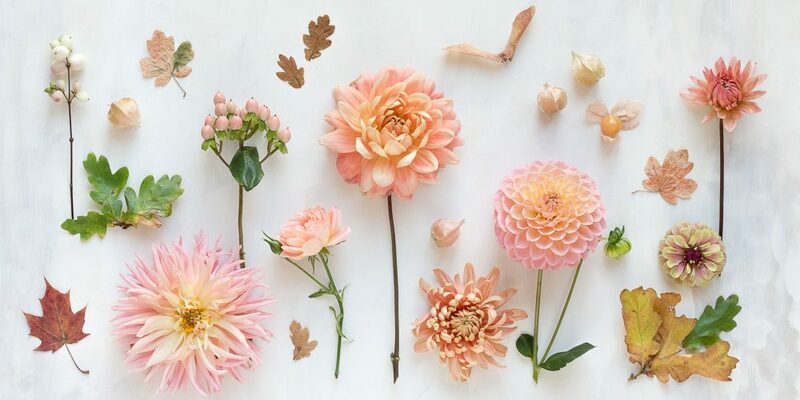 I love that I get to play with flowers so often, of course, and that every day I learn something new about creativity. What is your mantra/ favorite quote? Thank you Cristina for this interview. I’m excited to continue to follow your journey. Your work is amazing and brightens up my days a little more. 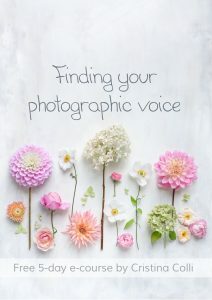 Cristina recently launched a free 5-day e-course to help you find your photographic voice, more info can be found on her website. Credit for all the pictures in this blog: Cristina Colli!